Italian-based PB Tankers has expressed concern at being included on the US Office of Foreign Assets Control (FAC) blacklist for allegedly trading with Venezuela. Like all the other crude tanker segments, Suezmax rates have been on a roller coaster ride over the past six months. Wallem has updated its corporate identity to mark the beginning of a profound shift in its service offering, the shipmanagement company said. Frantic buying ensued last week as the upcoming monsoon season and annual budgets begin to close in across the various subcontinent locations. The International Chamber of Shipping (ICS), the Asian Shipowners’ Association (ASA) and the European Community Shipowners’ Associations (ECSA) recently signed a joint memorandum of understanding in Singapore. In partnership with MAN Energy Solutions, Alfa Laval’s fuel conditioning module (FCM) LPG has undergone successful tests. Commodity trader Trafigura Group has entered into a joint venture agreement to create a commodity petrochemical trading business, focusing on bulk liquid chemicals. Despite outperforming the market on TCE and costs, 2018 was a financially challenging year for Maersk Product Tankers. As expected, the VLCC market bottomed before starting a soft rebound, particularly from West Africa and in the East. WinGD and ExxonMobil have announced a new collaboration project. Spire Maritime, a satellite AIS data analytics company, and AXSMarine have signed a partnership agreement to create what they claim will be a new level of accuracy in maritime intelligence for chartering and commodity markets. 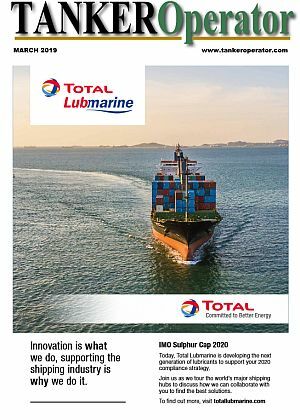 In support of customer preparedness for IMO 2020, Shell Marine is introducing Shell Alexia 40 – a new 2-stroke engine cylinder oil. Unique Group has become a major shareholder in Kamelia Cleantech. ChartWorld has launched My Route Appraisal (MyRA) digital routing service.